Before the famous Battle of Lepanto, one man saw the danger with great clarity. As the Turkish menace moved ever westward in 1570, Pope St. Pius contacted the chief rulers of the West to unite against an enemy that threatened them all. In vain. Even Philip II of Spain, champion of the Catholic cause against the Protestants, was much occupied with his new American empire and did not answer the papal summons in person. He did, however, send his half-brother, Don Juan of Austria, a young man in his twenties, as well as dozens of ships. Once in Italy, Don Juan was joined by volunteers from all the Mediterranean countries and set about assembling a fleet in 1571. He managed to get about 208 ships (some eighty fewer than in the Turkish fleet), mainly contributed by the Papal States, Spain, and Venice, with a few from other Italian states. The allied states came to be known as the Holy League. On the flagship of the Genoese admiral, Giovanni Andrea Doria, was a curious picture that Philip II of Spain had sent him. Philip had received it from the archbishop of Mexico, who had commissioned it as a copy of the mysterious image of Mary that had appeared in 1531 on the cloak of an Aztec Indian. The archbishop, hearing the news from Europe of the Turkish offensives and the scramble to organize an effective defense, must have thought of the many miracles already associated with the image of Our Lady of Guadalupe. When the copy was finished, he touched it to the original and sent it to the king, advising him to have it displayed on one of the ships of the Holy League, in the hope of victory. Pope St. Pius was also seeking our Lady’s aid, through the recitation of the Rosary, which he asked all of Europe to pray for a successful outcome of the Christian offensive. When the ships set out from the Sicilian port of Messina on September 16, 1571, all of the men had rosaries too. This article is from Ten Dates Every Catholic Should Know. In Rome, Pope Pius had been meeting with his treasurer. Suddenly he rose, went to the window, and stood gazing intently at the sky. Then, turning, he said, “This is not a moment for business; make haste to thank God, because our fleet this moment has won a victory over the Turks.” The day was October 7, 1571, and what the pope apparently saw in vision — for the news could not possibly have reached him by natural means — was what has since been called the greatest sea battle since the Battle of Actium (between the forces of Mark Antony and Cleopatra, on the one side, and Octavian on the other) in 31 BC. Naval historians have analyzed it extensively, describing the maneuvering of the two fleets and the various tactics and weaponry used, and several websites provide maps and pictures as well as details. I will not go into the technical questions here, but a few points should be mentioned. The Turkish fleet was anchored in the Gulf of Corinth as the allied fleet approached. It probably outnumbered the Christian fleet, but the number of combatants seems to have been about equal; perhaps 30,000 on each side. The Christians had the considerable advantage of possessing six galleasses; these were larger than galleys and had side-mounted cannon — as opposed to the front-mounted cannons of the galleys. This allowed them to inflict great damage on any ship that came broadside to them. Some accounts say that as the fleets came within fighting distance of each other, early in the morning of October 7, the wind favored the Turks and blew their ships forward against the Christian vessels. Then the wind shifted, and Don John’s ships were able to draw close to the enemy. This was necessary, because sixteenth-century naval warfare included hand-to-hand fighting on the decks as well as bombardment by cannons and arrows. Scarlet running over on the silvers and the golds. . . . The sea was red with blood for miles around the battle site, when by the late afternoon of October 7, it was all over. The Holy League lost about 8,000 men and at least double that number wounded, but only a dozen ships. Around the same number of Turks died, but thousands more were captured, fifty ships were sunk, and at least 117 vessels were captured. When the news reached Europe, there was general relief, rejoicing, and thanksgiving. As for Pope Pius, he gave credit where it was due, declaring October 7 the Feast of Our Lady of Victory; it was later changed to the Feast of Our Lady of the Rosary — a name it still bears. The overwhelming significance of this great battle, the climax of the long Christian resistance to Muslim conquest, was that it ended any major Turkish attacks on the Mediterranean. The decimated Ottoman fleet would be partially rebuilt, and one or two islands and African coastal areas would later fall to Turkish attack, but never again would the Mediterranean be in such serious peril from the Turks as it had been before October 7, 1571. Spain would not be re-invaded by the Moors, and the rest of the southern shores of Christendom would be safe. One of the two main pathways to conquering Europe for Allah had been cut off for good. True, the Ottoman armies were still intact, and in the following century would mount one last campaign against Vienna. It would be their downfall. From the successful defense of Vienna, Christian armies would go on to roll back Turkish conquests from Hungary and much of the Balkans, although a few areas would not be liberated until the earlier twentieth century. With the help of Mary, as both Our Lady of Victory and Our Lady of Guadalupe, Christian saints and heroes of the sixteenth century had begun that liberation. Editor’s note: This article is adapted from a chapter in Ten Dates Every Catholic Should Know, which is available from Sophia Institute Press. Diane Moczar, Ph.D., serves as an adjunct professor of history at Northern Virginia Community College. Her articles have appeared in various publications such as Triumph, Smithsonian, Catholic Digest, and National Review. 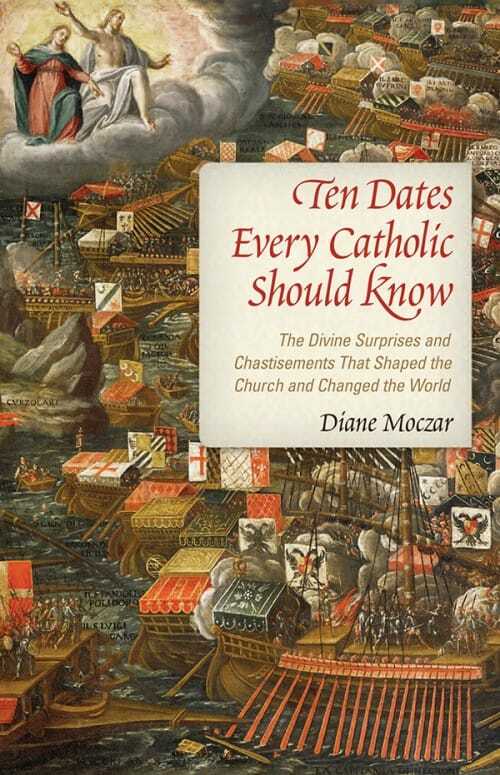 She is the author of Islam at the Gates, about Europe's wars with Ottoman Turks, Ten Dates Every Catholic Should Know, and Seven Lies About Catholic History. She earned a bachelor's degree in philosophy and history at the Francisco College for Women, as well as a master's degree at Columbia University. Dr. Moczar also completed her doctoral work at the Catholic University and George Mason University.